manila fashion observer: You Get Front Row Seats to these Fashion Shows! You Get Front Row Seats to these Fashion Shows! Hot off the sky high heels of The Devil Wears Prada comes literal "fashion shows" that promise to take us all behind the scenes of magazine publishing and the fashion industry. According to The New York Times, "Interest in the world of glossy publications and their semi-renowned editors has reached an apogee." From television shows, to chick-lit books to magazine editor memoirs, we're seeing fashion angled stories flooding the market. The NY Times hypothesizes that this is a result of the "copycat effect", wherein "Both the book and film adaptation of “The Devil Wears Prada” were runaway hits, so programming executives and book publishers are eager to repeat those successes." 1. Variety.com calls it "The Devil Wears Prada" -- the original. It seems Ms. Wintour wanted to cash in on her infamy (but hey I still love her!). "A&E IndieFilms and R.J. Cutler are bringing fashion dynamo Anna Wintour to the bigscreen in a feature-length documentary chronicling the making of Vogue's September issue. Cutler will direct the untitled pic, to be shot over the next eight months as Wintour, the infamously demanding editor-in-chief of Vogue, prepares the heavyweight fall fashion issue." "You see fictionalized versions of Anna all over the place now," Cutler said. "None of them, of course, are as fascinating as Anna herself." 2. Vogue UK spills the beans on a SPIELBERG directed fashion show! Imagine! He has "tapped Christy Turlington and Ed Burns to work with him on a new drama series set in the fashion world. The Hollywood director, who was inspired to put the project together after attending New York Fashion Week, approached Burns, who starred in Spielberg's Saving Private Ryan, and his supermodel wife, who have been close friends of his for some time. Both will act as executive producers on the show that, according to CONTACTMUSIC.COM, will focus on five twenty-somethings with fashion jobs including a photographer, a designer, a make-up artist and a model." 3. 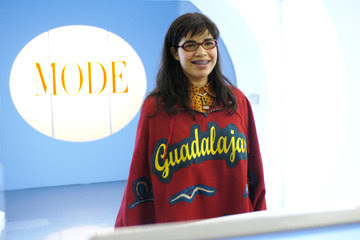 An unlikely fashion heroine, "Ugly Betty" is "the oversized peg in the petite round hole" of fashion magazines, played by the award-winning actress America Ferrera of the show sharing the same name. The series is based on the Colombian telenovela "Yo Soy Betty La Fea," which I remember was shown here in the Philippines, and dubbed in Tagalog! And guess what! The show is produced by red carpet favorite/actress Salma Hayek!